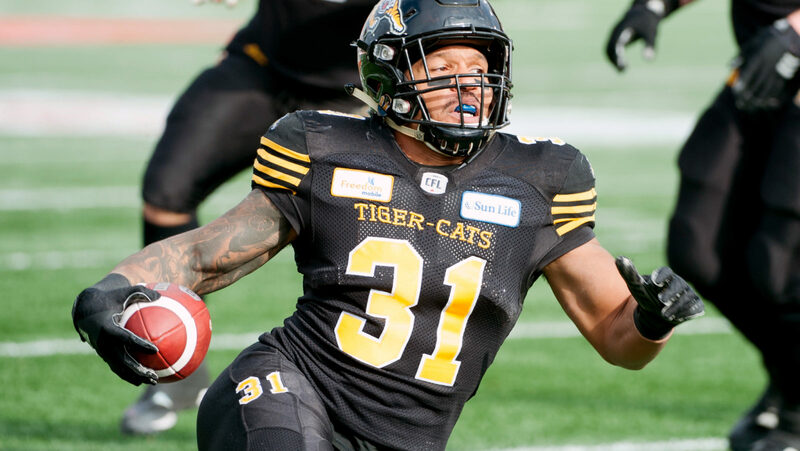 HAMILTON — The Hamilton Tiger-Cats announced Friday the football club has re-signed national running back/receiver Sean Thomas-Erlington to a two-year contract. He was set to become a free agent in February. The 26-year-old has played 28 regular season games with the Tiger-Cats over two seasons (2017-18), registering 35 carries for 219 rushing yards and a touchdown, and seven receptions for 93 receiving yards. On special teams, he has also added four tackles and returned 15 kickoffs for 339 yards (22.6 average). The five-foot-nine, 217-pound running back and receiver also suited up in both of Hamilton’s playoff games last season, posting three carries for 15 yards, three receptions for 24 yards and a touchdown, and two special teams tackles. Thomas Erlington was Hamilton’s eighth-round pick, 66th overall, in the 2017 CFL Draft. The Montreal, Quebec native played 28 games over four seasons from 2013 to 2016 for the University of Montreal, recording 253 carries for 1,405 yards and 16 touchdowns. He won the Vanier Cup with the Carabins in 2014 and ranked first in RSEQ rushing touchdowns with five in 2015.